I knew new details would be flooding the net for the next 6 months due to various interviews and possibly a new demo later this year, but I didn’t suspect us to receive anything new so soon, figuring they would just go on repeating what they already revealed at E3 this month. Apparently, I was wrong, As always, it’s story related and thus, spoilers are everywhere. Reader beware after the jump. NZG: My first question is about the story in Skyward Sword. What details can you give about the story as it stands now? Aonuma San (via Mr. O’Leary): Well, you saw the trailer this morning, and the presentation. The final scene is Link jumping off those cliffs and diving through the bank of clouds, and that’s a very key element behind the story in the Legend of Zelda: Skyward Sword. This time around, Link is living on a series of floating islands above the coulds, and that land is called Skyloft. Link lives in this floating land, and it’s his natural world, so he doesn’t think there’s anything strange about living above the clouds. One day, an incident occurs, and he discovers that beneath the clouds is another world, and that world is ruled by an evil force. And the thing that leads link on in his adventure and guides him is the titular sword – the Skyward Sword. When the sword is leading Link and helping him do things, it actually transforms into a human figure. [In] the artwork revealed at E3 last year, that was the figure that was in that artwork. So basically the story evolves in his travelling from Skyloft to the land below, and back and forth, as he is lead by the Skyward Sword. As he travels, the story of how the land below came to be ruled by these evil forces is revealed. I always felt I was in the minority here, but Skyloft isn’t the name of Link’s hometown, it’s the name of the entire “land” in the sky – which consists of several islands. Many people, as I have noticed, figured it was just one land mass that Link lived on, not fully realizing the potential that it’s an entire “continent” of islands up there. I admit that as soon as I saw it was confirmed he traveled back and forth, I instantly thought exactly what is now confirmed above. Many other people thought it was just a hub city, and I am glad it has been clarified. He had a lot more to say about Skyward Sword, Ocarina of Time, and of course… Multiplayer Zelda? NZG: What do you love most about the Zelda universe, and the world that has been created? Aonuma San: I think it kind of goes back to one of the key elements of the Legend of Zelds franchise, and that is the process by which the player finds hidden objects or hidden elements within the game world. So for us, and myself personally, one of the things that’s most fun is [asking] “How do I hide those elements, how do we go about leading the character to play where they [will] discover those elements?” We have a target emotion we are looking for, a target feeling we want to impart to the user, so in order to impart that particular emotion. It’s kind of that connection, and how it all fits together, that’s my favourite part of making games in the Zelda universe. NZG: Do you think that Skyward Sword has triumphed in that area? What you consider Skyward Sword’s greatest achievement to be? Aonuma San: The one thing I think we’ve done the best and that we’re happiest with is… of course, we talked about how nice it is to have that great one-to-one motion with the sword and how natural it feels… but for me it’s the item selection that seems to be the best thing we’ve done so far. If you look at the Zelda games we’ve done in the past you’ve had to go to a subscreen, select your item, then [go] back out to use that item. And now, you don’t have to do that any more. You just press the B button and point at your item, let go, and you can use it, super smooth. It seems very natural, and we’ve done a really great job of that. I think that’s at least one answer to your question! NZG: Can you tell me a bit about the process – your process – for imagining the world of Legend of Zelda, imagining the characters, and imagining how it will all fit together? Aonuma San: Creating characters is obviously a lot of hard work – it takes a lot of time. Obviously, we have to go through and look at Link himself, and look at the character models and animations, and all of that, but we have to do the same sort of work with every character that appears in the game. We look at the game world and say “This sort of character has to live here.” If you look at the geography, or whatever it is, the environment, this character has to be in this place. So then we go through the process of creating the character that we have dictated to ourselves has to exist for that game world to seem real to the end user. So that’s sort of the process: “How can we make this world feel real to the user?” Well, by creating characters that fit the game world. It’s sort of a chicken and egg thing almost – which one comes first? And it’s not only characters that match the world they’re inhabiting or populating, but taking the people that we see around us and putting that sort of character type within the game. For example you’ve got the Gorons, which are obviously these interesting and mysterious characters that live within this specific place in the world, but you look at the personalities of those characters, and they seem like those are actually people you might meet. Not their physical characteristics! But their personalities are representative of the people we see around us every day. NZG: The Zelda set, the fans of the series, are obviously die-hards in many respects. They live and breathe the universe. How has Skyward Sword been developed, if at all, to try and attract new gamers? Aonuma San: Obviously, we are always keeping new users in mind, but we are also very appreciative of the fans who continue to play the Legend of Zelda series. We are always thinking of how we can evolve the franchise, both to please our long time fans, and also create games that new users will enjoy as well, so we look at the feedback we receive and try to take that influence into what we do. That doesn’t mean we sit there and think “What can we do in this game to attract new users?” but what we are thinking is “How can we make this game accessible? How can we make this game enjoyable for anyone who wants to play it?” I think by looking at it that way, we sort of naturally evolve the series, and find that the games naturally appeal to those who might not have played them in the past. NZG: That’s a really interesting point about taking feedback into account – this is a question I ask of a lot of developers I sit down with, but, are reviews important to someone at your level? NZG: Can we just go back to a question I asked earlier about Skyward Sword’s greatest achievement – I got the one-to-one motion of the sword; great. Item selection; great, no subscreen. It just seems to me that for a game that’s been so anticipated and that people are so excited about… would you go further than that? Is there something a whole lot bigger? What have you tried to achieve, and have you got there? Aonuma San: One of the things we look at when we’re creating a Legend of Zelda game, and with any of our games, is “What’s unique? What are we going to put into the game that a user finds unique? How are we going to surprise them?” That’s our goal. We want to bring them a new experience and get that sort of “A-ha! Wow!” moment. And that starts really with gameplay, and that stars with how we implement the item selection screen, or how we do the controls. It starts with gameplay. It’s not just saying, “I think the users will find this new or exciting, so I’m gonna dump it in here”. It has to fit within the world, and it has to match up with the gameplay. So, for us, it always starts with that foundation. And here that foundation is the gameplay. So that has to be really solid first before we can go and add all of these other elements that we want to use to impart that emotional impact to the users. And that’s a lot of fun for us, getting that foundation all polished up. And for us right now, that’s where we’re at with this project, so now it’s just a matter of going back and really adding all of those surprises and unique elements that layer on top of the solid foundation that we’ve built. NZG: What personal experiences have you had that have translated to how you develop games and the kinds of things that have informed the development of your games? Aonuma San: Well, a lot of things that I did… when I was a university student I put together [figures that] have some limited motion using gears, and it was about how I put gear A into slot B and finding out exactly what sort of motion I could create with these figures. It’s really that – looking at the nuts and bolts of something and how it fits together, and what that… taking that experience and applying it to games. I am not a programmer, but I like talking to programmers and saying, “We want to do this, what do you have to do to make that happen?” Putting all those puzzle pieces together is something that comes from that experience, and that’s how I approach things when I am making a game or thinking about the game. It definitely informs my process. NZG: So would it be fair to say that a lot of your input into Skyward Sword has been the purpose, rather than the process? Aonuma San: Yeah, I think that is pretty fair. You know, one of the things… we have the director. And the director is putting all those pieces together; that’s his role. Myself, it’s a lot of talking with Mr. Miyamoto, about what we want to do this time, and then of course talking with the director and sitting down together. The theme around this project has really been back to basics – stepping back and talking with Mr. Miyamoto, [and asking] what is it that makes Zelda fun? Why do people play the Legend of Zelda? Sort of reassessing that for ourselves and getting back to the core of what appeals so much about Link and the Legend of Zelda, and the world that he inhabits, and trying to do that again this time in a new and fresh way that the fans will appreciate. NZG: Do you have a favourite Zelda game, and why? Aonuma San: I think that rather than say my faourite, I can tell you that the one that’s the most memorable. The one that stands out is the first Zelda game I worked on; that was Ocarina of Time. Of course, because it was the first one, there’s obviously lots of expectations that I placed upon myself, and lots of goals I wanted to reach, and that’s the one that’s the most memorable because it was all new experiences. That being said, [the goal of] every title I have worked on since then, the title I am working on now, is to go beyond Ocarina of Time and create something greater than that. To surpass what we do. NZG: Ocarina’s my favourite as well, and I’m sure everyone loves it. If I can go off topic for a second, my absolute favourite part is when Link walks out onto Hyrule field for the first time and it all just opens up – I remember sitting at my N64 and my eyes just popped out of my head. I could go here, I could go there… it was a real achievement. Aonuma San: That was somehting that Mr. Miyamoto was really focused on. He said he wanted absolutely for the player to have the same exact reaction that link would as he stepped out of the forest and saw that open area. He wanted the player to have the same exact emotional reaction that link would. So that was Mr. Miyamoto’s direction, to really focus on getting that across. NZG: What the Wii can do, and the motion controls… is that doing enough for the Zelda franchise, and is it doing what you want it to? I don’t expect you to slam down on the techs behind the hardware, but was there any point where you hoped for more from the Wii and Wii Motion Plus? 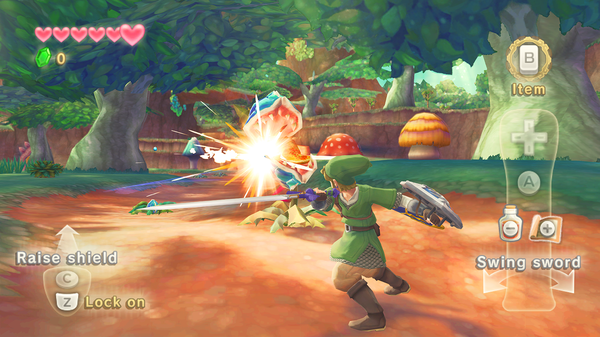 Aonuma San: Wii Motion Plus was created to improve upon the remote. So, we’re always looking at how we can improve and make better the tools we are working with. When we first got the Wii remote, we said “Oh, we can do this. So, let’s go create games with this.” And when they said “Oh by the way, here’s Wii Motion Plus…” that’s really driven by the developers asking for better stuff and the techs developing better stuff. When we got Wii motion plus we said, “Okay, now lets go out and create games with this.” That’s what we have here with Legend of Zelda: Skyward Sword, which is based on what we can do with the new technology. Of course, we are always thinking “If we had this, we could do that,” and we are also saying “We have this, now lets think of new ways to implement it.” It’s both – do we ask for new devices and new technologies, or do we work out how we can better implement it within our existing technology? We do both. All the time. Rather than say “Boy, it’s too bad we couldn’t do this,” we have this “what can we do with it?” [attitude]. NZG: Since Ocarina was such a runaway success do you now feel that you’re chasing something? If that’s the case, do you think you’ll ever be able to get there? Aonuma San: Of course we’re always trying to do is surpass it, but what we’re really trying to surpass are memories. And that’s just so hard to do. If you have something that when you first played it… or if you received a gift, or had something that made you happy, and then later on in your life you received another gift that made you happy, that doesn’t really make you go, “I’m happy now, I guess I really wasn’t that happy then…” So, while we’re always trying to surpass it, it’s something that’s really hard to do. This interview was courtesy NZGamer. This interview was taken during E3, so keep in mind at this juncture, Ocarina of Time 3DS was not shown yet. A lot to dissect folks. What do you think?